First Picture: Trading Post Quality Coyote. See a size comparison with a soda can. Third Picture: Coyote with Feet. See a size comparison with a soda can. Fourth Picture: Mounted Coyote Skin. See the back with an 18" long ruler. We offer coyotes in a range of qualities—from reject grade up to the best quality, large, eastern, heavy skins available. The Best Grade skins are fashion quality skins. The Trading Post skins are suitable for hanging on a cabin wall or better quality craft use. They are a middle-of-the-road coyote skin with good heads, good bodies, and good tails. They are not fashion quality skins, nor are they junk. The Craft Grade skins are generally good for cutting up or for use in projects that do not require a perfect skin. They have weak hair. The Reject Grade have extensive rips, tears, and may be missing the head and tail. 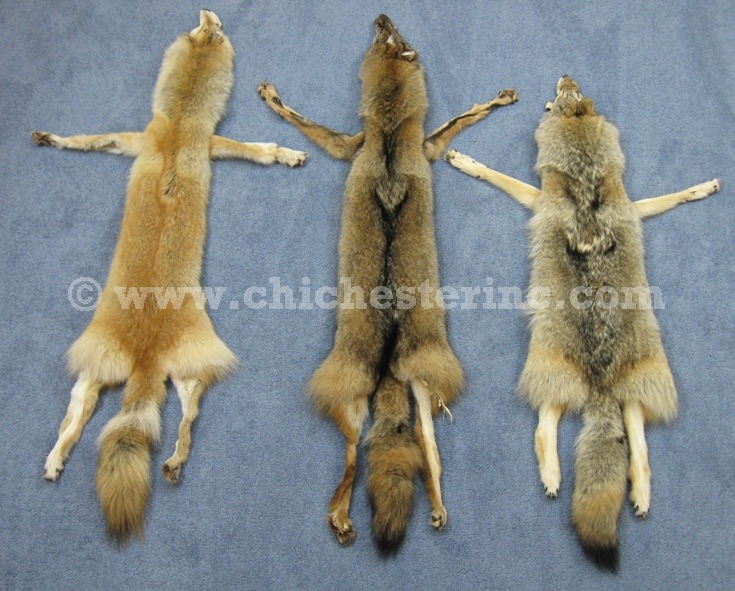 The skins come cased, but have no lower jaw and are not suitable for taxidermy. The skins range in length from around 53" to 62" when measured from the tip of the nose to the tip of the tail. When they are measured from the tip of the nose to the base of the tail, they range from 39" to 45". The shoulder widths fall between 5" to 6.5", waists range from 7" to 9.5", and hips, from 13" to 15". They are about 7" wide. Hair length is approximately 2.5" long. If you lay the skin flat and stick a ruler in it, the pile is about 0.5" high. A skin weighs approximately 1 lb 10 oz (0.733 kg). 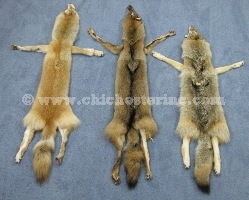 The mounted coyote skins are mounted on a black felt backing and are good as rugs. Our Gxx codes denote individual pieces. 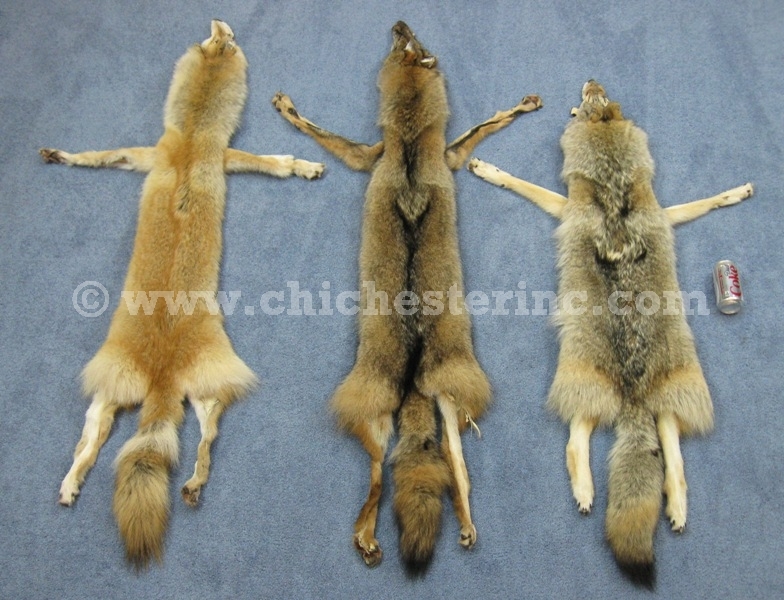 If you would like to order a specific coyote skin, please go to our Gallery to pick the exact one shown.